Martin Whitmarsh has officially left his role as McLaren team principal after spending 24 years with the team. Ron Dennis took control of the team when he was appointed chief executive officer in January. Whitmarsh worked as head of operations, managing director and chief executive before taking over from Dennis as team principal in 2009. 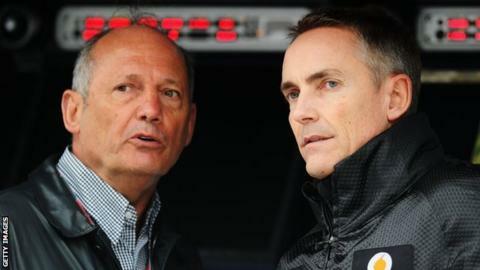 A McLaren spokesman said: "McLaren and Martin Whitmarsh have agreed amicably to part company." After gaining control of the team at the start of the year, Dennis formed a new management structure, with Eric Boullier as racing director and Jonathan Neale appointed Group F1 CEO. Dennis had been in dispute with Whitmarsh for two years and had tried to remove his former protege from his position on several previous occasions. McLaren had their worst season for three decades in 2013, failing to secure a podium finish for the first time since 1980. They are currently fifth in team standings with seven races remaining in the 2014 season.